Dr. Dalinda (“Dali”) Martínez is currently Associate Director of Member Engagement for the Coalition for Acesss, Affordability and Success, a diverse group of more than 140 distinguished colleges and universities that is committed to making college a reality for all high school students through a set of free online college planning tools that helps students learn about, prepare for, and apply to college. Dali provides hands-on support and engagement with the Coalition’s 140-plus member schools. In addition, she manages and supports the Council of the Coalition Counselor Community, a group of educators who provide direction for the Coalition’s student outreach and programming efforts. Dali has over 15 years of experience in higher education, in administrative, academic and policy roles. She focuses her passion, work, and scholarship around access and student success for undeserved students, and believes in creating support systems that help students get into and through higher education institutions. Dalinda contributed to the Michigan State University Office for Inclusion and Intercultural Initiatives playing a key role in the office’s strategic efforts on data analysis, project management, and social media analytics. 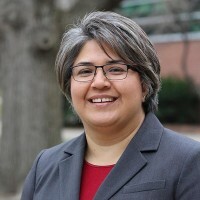 While at Michigan State University, she contributed to several National Science Foundation grants as a research associate examining institutional sustainability of recruitment and retention of women faculty in the STEM fields. She also used her professional and research skills to implement a university-wide effort to help with the professionalization of graduate students. In 2016, Dalinda was awarded the Barbara K. Townsend Dissertation of the Year Award by the National Institute for the Study of Transfer Students for her work titled Transitioning: Experiences of Transfer Students. Her research examines the post-transfer experiences of transfer students at the receiving institution. Assisted the Principal Investigator on a National Science Foundation grant; a three-year study of 19 institutions using a mixed-methods approach to assess effective strategies for the retention and advancement of STEM women faculty, guided by conceptual frameworks concerning organizational change and faculty work. Contributed to the selection of five case-studies for in-depth examination and site visits; decision making role to direction of study; reported findings. Produced outcomes and deliverables that provided specific evidence-based information and detailed case examples to a wide variety of audiences. Taught UGS 101: Success Strategies in Higher Education; an interactive seminar designed to build a foundation of knowledge and orient undergraduate students for success. Worked with UGS leaders to evaluate program to ensure goals and objectives were appropriate for program. Developed and delivered multimedia curriculum for faculty & staff of the College of Education. Facilitated group and individual instructional design, including multimedia learning. Evaluated programs to assess best practices for recruitment, collected and analyzed data to establish recruitment goals, and facilitated trainings on admission update procedures for 150 high school counselors. Maintained connections with community leaders and the Rio Grande Valley media to establish positive relations with historically underrepresented communities to complement main campus objectives. Collaborated with campus partners to provide professional development opportunities for future faculty. Coordinated presentations for faculty and staff to provide parallel mentoring to undergraduates, graduate students, and post-docs. Analyzed data for the Summer Research Opportunities Program and Alliances for Graduate Education and the Professoriate. Administered and managed the start-up of the Texas Counseling Initiative in South Texas. Collaborated with Princeton Review offices across the state of Texas to help facilitate trainings. Coordinated trainings for clients and staff on web-based monitoring system and advising skills. Researched, planned, and executed an incremental, school-wide, service learning program, Matched more than 75 local nonprofit organizations with high school students. Developed curriculum for a Service Learning program designed to place high school students in internships. Collaborated with teachers to develop, plan, and integrate curriculum. Analyzed data for the Education team on the grant expenditures. Researched expanding grant making areas, including urban areas that seek to boost secondary education. Created ways to improve the team’s knowledge management function. Analyzed peer institution application and review processes, and examined staff training of those that review admission applications. Conducted document analysis, interviews and observations at select institutions. Presented report that included recommendations for applicant review process. Represented the College of Education at various university and school visits on a faculty-led three-week study tour of primary, secondary, and higher education institutions as an immersion into Mexico’s political, cultural and economic life. Participated in faculty-led two-week collaborative professional experience at Nelson Mandela Metropolitan University. Presented on scholarship of teaching and learning for faculty and staff. Dalinda holds a Bachelor’s degree in Spanish and a Master’s degree in Organizational Learning & Instructional Technology, with a concentration on organizational development, from the University of New Mexico, Albuquerque. She completed her Ph.D. in Higher, Adult, and Lifelong Education at Michigan State University. Her research interests include educational policies regarding student success, access, diversity, and transfer students, and she has published and presented on many of these topics.